Southern Thailand is a southernmost cultural region of Thailand, separated from Central Thailand region by the Kra Isthmus. From upper-left to lower-right: Sunrise Thailand Ko Samui, Tarutao National Park, Wat Phra Mahathat Woramahawihan, Rajjaprabha Dam and Phuket City. Southern Thai • Pattani Malay • Satun Malay • Mos • Urak Lawoi' • Moklen • Hokkien etc. Southern Thailand is on the Malay Peninsula, with an area of around 70,713 km2 (27,302 sq mi), bounded to the north by Kra Isthmus, the narrowest part of the peninsula. The western part has highly steep coasts, while on the east side river plains dominate. The largest river of the south is the Tapi in Surat Thani, which together with the Phum Duang in Surat Thani drains more than 8,000 km2 (3,100 sq mi), more than 10 percent of the total area of southern Thailand. Smaller rivers include the Pattani, Saiburi, Krabi, and the Trang. The biggest lake of the south is Songkhla Lake (1,040 km2 (400 sq mi) altogether). The largest artificial lake is the Chiao Lan (Ratchaprapha Dam), occupying 165 km2 (64 sq mi) of Khao Sok National Park in Surat Thani. Running through the middle of the peninsula are several mountain chains, with the highest elevation at Khao Luang, 1,835 m (6,020 ft), in Nakhon Si Thammarat Province. Ranging from the Kra Isthmus to Phuket Island is the Phuket chain, which connects to the Tanao Si Mountain Range further north. Almost parallel to the Phuket chain, but 100 km (60 mi) to the east is the Nakhon Si Thammarat or Banthat chain, which begins with Samui Island, Ko Pha Ngan, and Ko Tao in Surat Thani Province and ends at the Malaysian border at the Ko Ta Ru Tao archipelago. The border with Malaysia is formed by the Sankalakhiri range, sometimes sub-divided into the Pattani, Taluban, and Songkhla chain. At the Malaysian border the Titiwangsa chain rises up. The limestone of the west coast has been eroded into many steep singular hills. The parts submerged by the rising sea after the last ice age now form many islands, like the well-known Phi Phi Islands. Also well known is the so-called James Bond Island in Phang Nga Bay, featured in the movie The Man with the Golden Gun. The population of the growing region is projected to be 9,156,000 in 2015, up from 8,871,003 in 2010 (census count and adjusted), despite these figures are adjusted for citizens who have left for Bangkok or who have moved to the region from elsewhere, as well as registered permanent residents (residency was problematic in the prior 2000 census), the figure is still misleading. There are still a huge number of migrant or informal workers, temporary workers, and even stateless people, and a large expatriate population which is not included. Malay Muslim provinces in Southern Thailand and northern Malaysia. The Malay peninsula has been settled since prehistoric times. Archeological remains were found in several caves, some used for dwellings, others as burial sites. The oldest remains were found in Lang Rongrien Cave, dating 38,000 to 27,000 years before present, and in the contemporary Moh Khiew cave. In the first millennium Chinese chronicles mention several coastal cities or city-states. No exact geographical locations were recorded, so the identification of these cities with later settlements is difficult. 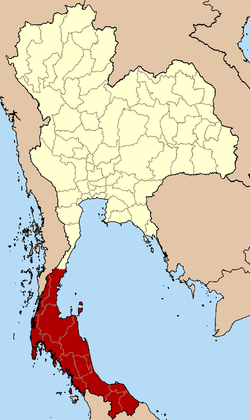 The most important of these states were Langkasuka, usually considered a precursor of the Pattani Kingdom; Tambralinga, probably the precursor of the Nakhon Si Thammarat Kingdom, or P'an-p'an in Phunphin district, Surat Thani, probably located at the Bandon Bay Tapi River. The cities were highly influenced by Indian culture, and have adopted Brahman or Buddhist religion. When Srivijaya in Chaiya extended its sphere of influence, those cities became tributary states of Srivijaya. The city Chaiya in Surat Thani Province contains several ruins from Srivijaya times, and was probably a regional capital of the kingdom. Some Thai historians even claim that it was the capital of the kingdom itself for some time, but this is disputed. After Srivijaya lost its influence, Nakhon Si Thammarat became the dominant kingdom of the area. During the rule of King Ramkhamhaeng the Great of Sukhothai, Thai influence first reached Nakhon Si Thammarat. According to the Ramkhamhaeng inscription, Nakhon Si THammarat was a tributary state of Sukhothai. During most of later periods, Nakhon became a tributary of Ayutthaya. The deep south belonged to the Malay sultanates of Pattani and Kedah, while the northernmost part of the peninsula was under the control of Bangkok. During the Thesaphiban reforms at the end of the 19th century, both Nakhon Si Thammarat and Pattani were incorporated into the central state. The area was subdivided into 5 monthon, which were installed to control the city states (mueang). Minor mueang were merged into larger ones, thus forming the present 14 provinces. With the Anglo-Siamese Treaty of 1909 the boundary to Malaysia was fixed. Kedah came under British control, while Pattani stayed with Siam. The main language is Southern Thai (Thai: ภาษาไทยใต้ [pʰaːsǎː tʰajtâːj]), also known as Pak Thai or Dambro (Thai: ภาษาตามโพร [pʰaːsǎː taːmpʰroː]), which is a southwestern Tai language spoken in the 14 changwat of southern Thailand as well as by small communities in the northernmost Malaysian states. It is spoken by roughly five million people, and as a second language by the 1.5 million speakers of Patani Malay. Third language is Central Thai which speak by local non-Peranakan Chinese origin (mainly Teochew and Cantonese), Central Thai mainly speak large city such as Hat Yai and Bandon districts, it's also common in Betong District, however most of people in Southern Thailand are also fluent or understand the Central Thai dialects. Southern Thailand has around 8.734 million inhabitants and its population density is around 126 per square kilometre (330/sq mi). 1 Hat Yai 159,627 397,379 in Hat Yai District. 2 Surat Thani 130,114 177,242 in Mueang Surat Thani District. 3 Nakhon Si Thammarat 104,948 271,330 in Mueang Nakhon Si Thammarat District. 4 Phuket 78,923 238,866 in Mueang Phuket District. 5 Ko Samui 65,847 82,900 in Ko Samui–Ko Pha Ngan. 6 Songkhla 64,602 163,083 in Mueang Songkhla District. 7 Yala 61,293 167,582 in Mueang Yala District. 8 Trang 59,999 156,115 in Mueang Trang District. 9 Pattani 44,900 130,178 in Mueang Pattani District. 10 Narathiwat 41,572 124,049 in Mueang Narathiwat District. The bulk of the southern population relies on agriculture for 27 percent of its gross regional product in 2014. It is followed by industry (12 percent), trade (10 percent), transportation (9 percent), tourism (8 percent), and construction and property (7 percent). Southern Thailand is connected with Bangkok by railway as well as highway. Several regional airports are located at the larger towns. The transportation hub of all south Thailand is Hat Yai. Phetkasem Road is the longest road in Thailand, running from Bangkok along the Kra Isthmus and then along the west coast of the peninsula. From Trang it crosses over to the east coast to Hat Yai, and ends at the Malaysian border. Two Asian highways run through Southern Thailand: Asian Highway 2 runs mostly parallel to the railroad all the way from Bangkok. It crosses to Malaysia at Sadao, and continues on the west side of the peninsula. Asian Highway 18 begins in Hat Yai and runs south along the east coast, crossing to Malaysia at Sungai Kolok. The southern railway connects Bangkok to Hat Yai, and continues from there to Sungai Kolok. There are branches from Ban Thung Phoe Junction to Kirirat Nikhom. Two smaller branches of the railway run from Thung Song to Trang and Nakhon Si Thammarat, and from Hat Yai Junction to Malaysia and Singapore. Southern Thailand has five international airports and six domestic airports. As of 2018[update] Thailand's transport ministry is constructing the 1.9 billion baht Betong Airport. It is scheduled for completion in 2020. OK Betong — Thai film set in Southern Thailand. ^ Wangkiat, Paritta (25 August 2017). "Songkhla power plant sit-in an energy wake-up call". Bangkok Post. Retrieved 25 August 2017. ^ Sritama, Suchat (27 August 2018). "Better days around the bend". Bangkok Post. Retrieved 27 August 2018. Suthiwong Pongpaiboon. Southern Thai Cultural Structures and Dynamics Vis-à-vis Development. ISBN 974-9553-75-6. 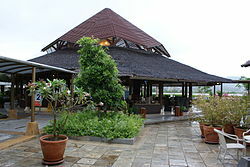 Wikimedia Commons has media related to Southern Thailand.